Here is a William VIX FIX indicator for Metatrader 4 software. William VIX FIX is a bottom predicting indicator created by Larry William it is also called as synthetic VIX we had already covered enough articles here in marketcalls. VIX FIX indicator is already coded for Amibroker as well. 4)Now goto terminal under Navigator->Indicators you should be able to spot William VIX Fix indicators over there. Now double click to apply the indicator. I dont have any idea. Presently it works good in longer timeframe. After modifying, how to compile the lines, please inform. I am not a programmer. It opened in the editor when I double clicked but then how to save and copy the file. I copied it into MT4, but the circles which you have made doesnt appear indicating the points. It is just to show in the example, i mean these circles or is it a part of the indicator. please inform. 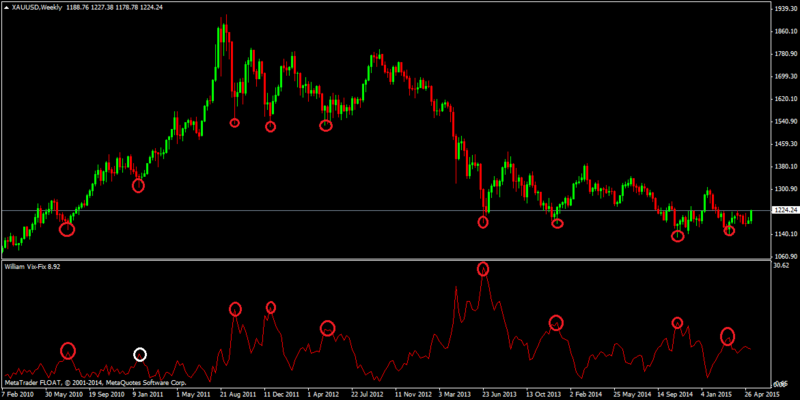 Is it possible for you to add moving average and cross over alert for it. please nachiket can you post your modify version, thanks. your site is incredibly usefull!!! Thanks a lot for your work! I have a question about backtest in amibroker, how can I setup rollover/swap during backtest? I’d found option for “spread” (commission) but not for rollover. Something like swap in metatrader4, thank you very much.